(1) French for 'treasure", meaning a rare and invaluable object, it is at the heart of all passions and quests; immaterial richness, like that of a beloved one or the treasured moments of love. (2) Eau de Toilette with precious natural raw materials (Airy heart of Damascena Rose Essence and Violet Flower; Alexandrian Jasmine Absolute; Essence of Imperial Sandalwood), tenderly interlaced with milky musks. (3) Legendary olfactory signature, reinterpreted by one of the greatest French master perfumers, as the sensuality of one skin touching another. 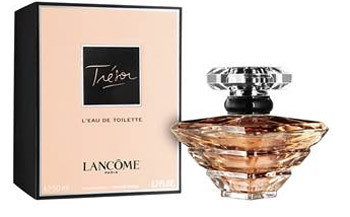 Infinitely delicate, Trésor L'Eau de Toilette celebrates the iconic original by accentuating the lightness of its timeless fragrance thanks to an airier composition defined by its incredible tenderness. Its rose-violet accord – the emblematic Trésor signature – is enveloped in a caress of musk, like a warm breeze over skin. Rosa Damascena is interwoven with two deeply sensual notes that echo and embrace each other like lovers. On the one hand, a vibrant fruity facet of violet and jasmine overlays a peach and bergamot essence accord. On the other, a reassuring, graceful facet composed of natural and utterly addictive vanilla extracts dressed in notes of musk and tonka bean absolute. Accentuated by a milky accord, the fragrance offers a moment of tenderness like a soothing cocoon for a sensation of absolute well-being. Infused with its patchouli heart, this new variation on Trésor caresses skin with the most delectable freshness imaginable. The sensuality of skin-on-skin; the tranquillity of an embrace. For this new olfactory variation, a new interpretation in colour: the elixir of Trésor L'Eau de Toilette is tinged with the soft shades of delicate peach flesh. It is housed in the emblematic Trésor flacon, inspired by luxury glass-making and haute jewellery with its crystalline walls and pyramidal silhouette. A brute gem with clean lines enhanced by a black lacquer ring, the symbol of an eternal union. Trésor L'Eau de Toilette thus sheds new light on the classic tale of true love that Trésor represents, exploring a tender kind of love and skin-on-skin complicity. An expression of ultimate love and radiant, confident and accomplished femininity embodied by Penélope Cruz, the iconic Trésor woman.